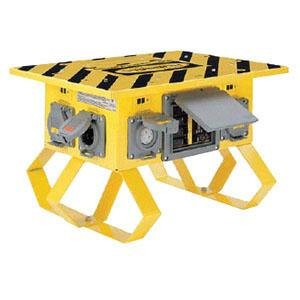 Hubbell-Wiring Spider® II Straight blade temporary power box delivers safe and reliable distribution of electrical power for a wide variety of temporary power applications. It features individual GFCI modules, gasketed latching receptacle lift covers and replaceable legs. It has voltage rating of 120/240-Volt AC and current rating of 50-Amps. It is NEMA 3R rated. This power box is suitable for indoor and outdoor wet and dry locations. Temporary power box is UL listed and meets NEC, ANSI/NFPA standards.